I don’t know if I’d really want to be swimming a foot from an outboard motor. Perhaps I’m just a coward. For new thrills at the beach this summer, build one or all of these novel fun wheelsâ€” the head-over-heels Aqua-roller, the Outboard Swim Spinner, or the Barrel-boat that rolls over sea or sand. 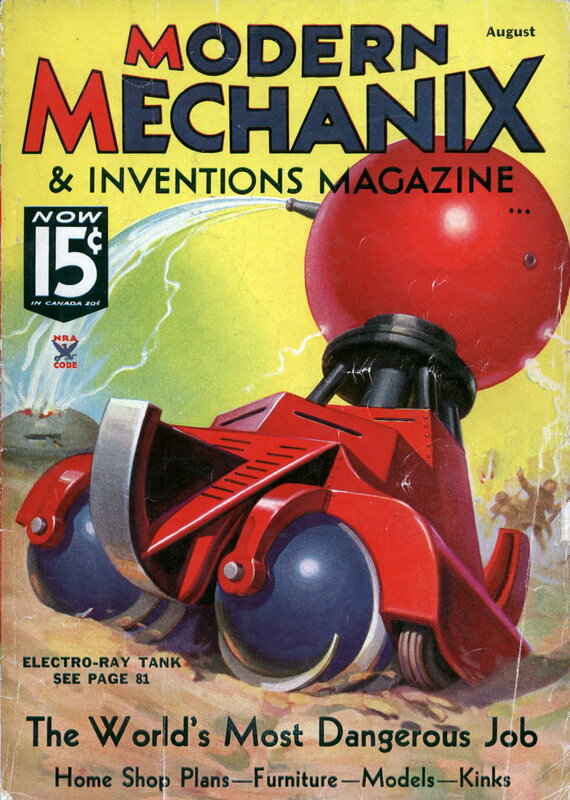 FROM far-off Holland comes the design for the first of MM’s water wheelsâ€”an Aqua-roller originated by P. C. van Petegem. A wheel of tubular floats mounted on a frame of two steel hoops rolls along the water as the bather shifts his weight from side to side inside the wheel. Build this if you like topsy-turvy fun. Make a dozen tubular floats by soldering circular discs over the ends of six to eight foot lengths of galvanized stovepipe eight inches or so in diameter. Two lengths of one-inch pipe are bent into hoops not more than six and one-half feet in diameter, the ends being fastened with a coupling or welded together. Space the floats equi-distant along the hoops, fastening with wire and solder, then make foot and hand holds and a padded head rest. Just as the aeroplane swings at carnivals whirl fun-seekers through the air, the Outboard Swim Spinner tows swimmers through the water at breathtaking speed. 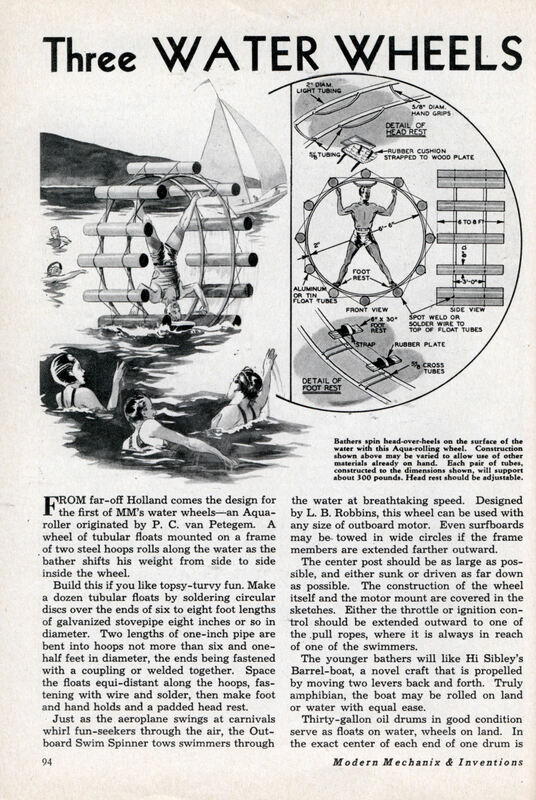 Designed by L. B. Robbins, this wheel can be used with any size of outboard motor. Even surfboards may be towed in wide circles if the frame members are extended farther outward. The center post should be as large as possible, and either sunk or driven as far down as possible. The construction of the wheel itself and the motor mount are covered in the sketches. Either the throttle or ignition control should be extended outward to one of the pull ropes, where it is always in reach of one of the swimmers. The younger bathers will like Hi Sibley’s Barrel-boat, a novel craft that is propelled by moving two levers back and forth. Truly amphibian, the boat may be rolled on land or water with equal ease. Thirty-gallon oil drums in good condition serve as floats on water, wheels on land. In the exact center of each end of one drum is welded or riveted a 3-inch long axle with flange, for the front roller. On the rear roller longer axles are attached, with cranks at the outer ends set at a 90-degree angle to each other. Angle iron paddles are welded or riveted to the rear drum, and all leaks stopped up. Axle bearings have brass bushings cut from tubing, to prevent wear and reduce friction. Make the framework light but strong, using only screws for fastening, and reinforcing with a strap iron X-brace at the bottom. Paint all of your beach equipment in gay colors, first applying two or more coats of marine paint to all metal parts to prevent rusting. Stay out of the deep water with all of these wheels. They’ll work just as well in water three to five feet deep, and there will then be little danger of an accident.